We do not require reservations for our cruises. We strongly recommend making reservations for our dining cruises, as walk up availability may be limited. We do also recommend giving us a call to check on all cruises before coming down to the ship, just to make sure there is space available on that departure. What do my tickets include? Your scenic and sunset cruises include the cruise. Food and beverage may be purchased a la carte. Our lunch and brunch cruises include the cruise as well as the food. Our dinner cruises include the cruise, food and live entertainment. Additional taxes, fees and a $1.50 booking fee will be added on at check-out. Please note that none of our dining cruises include beverages or gratuity. Is your cancellation policy flexible? We think so! Our cancellation policy allows you to change or cancel your cruise on the day of the cruise with no penalty. For our daytime cruises (scenic narrated, lunch, and brunch), you must cancel prior to 9AM. For our evening cruises (sunset and dinners), you must cancel by noon. You may call us, chat with us or email us at spirit@soea.com to cancel your reservation. Because we allow day-of cancellations, we are very firm with this policy. Any time after 9 or 12 will be considered a late cancel, in which you will not be refunded. Special events are all sold as final-sale and may not be canceled at any time. 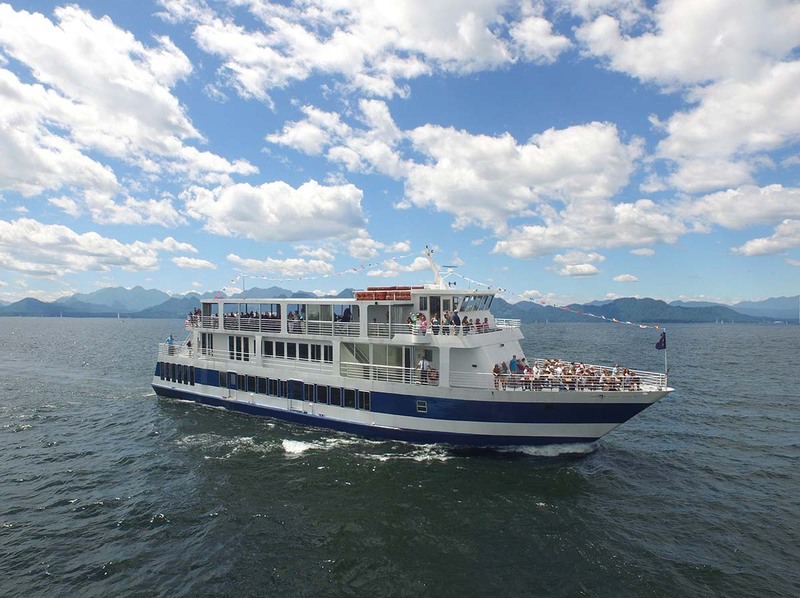 Special events include, but are not limited to, Mother’s Day Brunch, Fireworks Cruise, UVM Homecoming Cruises and more. We require a credit card to hold your reservation on the ship. Your card will not be charged until the day of the cruise at either 9AM or 12PM, in accordance with our cancellation policy. If you cancel within the allotted time, we will remove your credit card information and nothing will be charged to you. You may also pay cash in advance of a cruise at the ticket booth and your reservation will be held. All sales at the ticket booth are final sales. We accept MasterCard, Visa, and Discover. We prefer cash, as a 3% fee must be added to all credit card sales. You may use cash or the above credit cards for on-board purchases. There is not an additional 3% fee for on-board transactions. I have a coupon – what do I need to do? If you see a code at the bottom of your coupon, simply input the code into the reservation prior to check out and adjust the quantity as needed. Please make sure to print out coupons if you are inputting them into the system and bring them with you to the ticket booth to redeem. Tickets that are not inputted at the time of the reservation will not be validated, unless the guest calls prior to credit card processing on the day of the cruise. I have a Jump On It – what do I need to do? Jump On It guests should call us to confirm that there will be space available on the day they would like to cruise. Our reservation staff can certainly assist in telling you which days will have plenty of space, as well as dates that are sold out. Jump On It guests may NOT make reservations for our cruises. Please make sure you print your JOI coupon and bring it to the ticket booth to redeem. Please also note that there is a $3 per person charge on each JOI, as stated in the fine print. For our JOIs that include food, please remember they do not include gratuity for your server! I have a gift certificate – what do I need to do? Unfortunately, our online system does not handle gift certificates at this time. Please give us a call at 802-862-8300 to reserve your cruise with a gift certificate. Please have your gift certificate number ready when you call so we are able to find it in our system. Please also remember to bring your gift certificate on the day of your cruise to hand in to the ticket booth. Where is the ship located? We are located at the very bottom of College Street, right next to the Burlington Community Boathouse. You can plug 0 College Street into your GPS and it will take you to us. If the ship is not in dock, don’t worry! Just look for our ticket booth that has a sign that says BOAT RIDES. As there is limited real estate along the Burlington waterfront, we cannot offer our own parking lot. Please know that the price of parking has nothing to do with the Spirit. The lots along the waterfront and in Burlington are all privately or publicly owned. The closest parking lot to us is the Waterfront Lot, which is right on College Street, just past Lake Street. Another one of our recommendations is to park underneath the Hilton, or try to find metered parking in the surrounding area. ParkMobile is a wonderful app that allows you to pay with a credit card (and recharge from afar!) even on the old meters. Please check out www.parkburlington.com for more information or check out this interactive parking map! Is there public transportation available to the boat? **Schedule subject to change per Green Mountain Transit. Can we pick up tickets in advance? Tickets are will call at the ticket booth. Typically, you do not need to pick up tickets more than 15-30 minutes prior to each cruise. Before boarding the boat you must stop by the ticket booth to receive boarding passes. If you have already made a reservation, simply give the attendant your name and your tickets will be ready for you! If you see your name sticking out of a black booklet, that means you qualify for Express Check In! If you see your name, you are welcome to just take your guest check booklet. Inside, you will find your boarding passes and all the information you need. If you have not made a reservation you can purchase tickets from the ticket booth if there is space available. Once you have your ticket and the captain calls for boarding, you may board the ship and our employees will direct you to the proper deck. From there, all you have to do is enjoy the ride! What if it rains? Will you cancel? Our boat goes out rain or shine! We have both indoor and outdoor seating to suit the needs of our passengers. In cases of severe weather, cruising is at the captain’s discretion. Our captains are highly trained to drive in all sorts of weather, but if they feel unable to provide a safe trip for our guests, we will cancel the cruise. If you had plans on dining with us, we will hold the event dockside, and you can still enjoy your meal and entertainment (if applicable). Our Admiral deck, the bottom level of the ship, is wheelchair accessible and we have a very nice accessible restroom. We ask that you give us a call in advance to see how we can best help you and your loved ones have the most comfortable excursion on our ship! Can my pets come with me? Unfortunately, as we are a licensed restaurant, we do not allow pets on board unless they are certified service animals. Can I bring my own food and drink on board with me? We do not permit any outside food or beverages on to the boat. Due to the fact that we are a licensed restaurant, outside food presents a liability issue and we cannot allow food we have not prepared ourselves on board. However, our snack bar menu, buffets and plated meals are top notch! If you have allergy or dietary restrictions, feel free to call ahead and inform our staff so that we can try to work with you and make sure we have food you can eat. We do our very best to accommodate everyone! Our menus are marked with Vegan, Vegetarian, and Gluten Free symbols – many items are available for our guests with these dietary restrictions! We are also a nut free boat, however, some of our products may have been packaged in facilities that also process nuts. During our evening events we encourage people to dress nicely, due to the many celebrations we host. However, we do allow walk on guests and so we do not have any required dress code. We also suggest that our passengers bring an extra layer, such as a jacket or sweater! What about my dietary needs? We mark all vegan, vegetarian and gluten-free options on our menus and buffet cards. Further questions can always be directed to the staff. If you have special dietary needs, please call ahead and let us know. We would be more than happy to work with you on making sure your meal with us is as pleasant and filling as possible! Our ship is nut free, however, many of the products we use have been processed in factories that also process nuts. As of 2016, smoking is not permitted anywhere on the Spirit of Ethan Allen. Do you have special events? Absolutely! Our ship is available for weddings, birthday parties, class reunions, bar mitzvahs and more! For groups of twenty or more we offer discounted rates. Call ahead and work with our staff to put together the event of your dreams. We also put on events for special occasions, such as Mother’s Day, Father’s Day, and Burlington’s Fireworks Celebration on the 3rd of July. For more information on these cruises, visit our Special Event Cruises page under the Daily Cruises tab. During our scenic narrated tour, the ship heads North, towards Lone Rock Point. It loops around Juniper Island, goes past Rock Dunder and into Shelburne Bay. From there it heads back through the South End of Burlington. In the evenings, it’s the Captain’s choice. Our evening trips are always an exciting and surprising adventure – the captains know the best spots to view the prettiest sunsets! How far are you from Church Street Marketplace? What else is there to do in Burlington? What is the interior of the ship like? Our beautiful cruise ship offers three unique private decks. Our lower deck, which is wheelchair accessible, is the Admiral Deck. The midlevel of the ship is our Horizon Deck. Our top level, which can be converted to an open-air deck in the summer, is our Sky Deck. Each level of the ship has a different capacity based on Coast Guard regulation. We also rent out one, two, or all three decks if you are looking to host a wedding or a private event. We have our own on board galley and Executive Chef so we can serve your delicious meal piping hot! We specialize in Contemporary American Cuisine, and are delighted to offer an array of different menus, designed for ease of planning. We are more than happy to customize to your unique tastes, so please do not hesitate to ask us. Our offerings include buffet menus, plated menus and appetizer menus and packages. We understand food is one of the most important components of your Lake Champlain wedding, and we are pleased to offer the exclusive services of our amazing culinary team!